Doug’s grandmother was a skilled baker. She had the top of the line baking tools and gadgets needed to create special meals from scratch. Well before we moved in, Doug and I spent a great deal of time helping her go through her various items. When the time came, my job, alongside his grandma, was the kitchen. She rather enjoyed my adoration of her very beautiful and meticulously cared for kitchen items, including a 1950s Sunbeam W-2 waffle iron complete with a cloth covered cord. We discovered our similar opinion in the vast difference between a Belgian waffle and an old-school homemade waffle.The main and key difference being the size of the nooks. Once she realized my affinity for baking and cooking food from scratch, she began to set items aside for me that would stay in the house. The most prized possession, her waffle maker. Chromed, shiny, and retro at its finest. There was only one condition, I had to make good use of said items, and she wanted a continuous supply of waffles. Challenge accepted, Grandma. As it turns out, the rules are quite simple with regard to creating delicious old-school waffles using a retro waffle maker: Follow the instructions without deviation. Make zero substitutions. I learned this through several failed attempts at replacing key ingredients. This includes substituting butter for any kind of light butter, or whole wheat flour instead of white flour. Lastly, the cardinal sin of cooking and baking, adding items in a different order than what is specifically directed on the recipe. I can confidently state that I am indeed following the instructions, since I still possess the original insert that came with the box. Yet another bonus from years of care from Grandma Rynkus. I received her waffle making stamp of approval a handful of times, and started making enough for my grandmother as well. The waffle maker also made an appearance at our Retro Breakfast Cocktail Party. This entry was posted in Uncategorized on June 9, 2013 by Mary Grace. 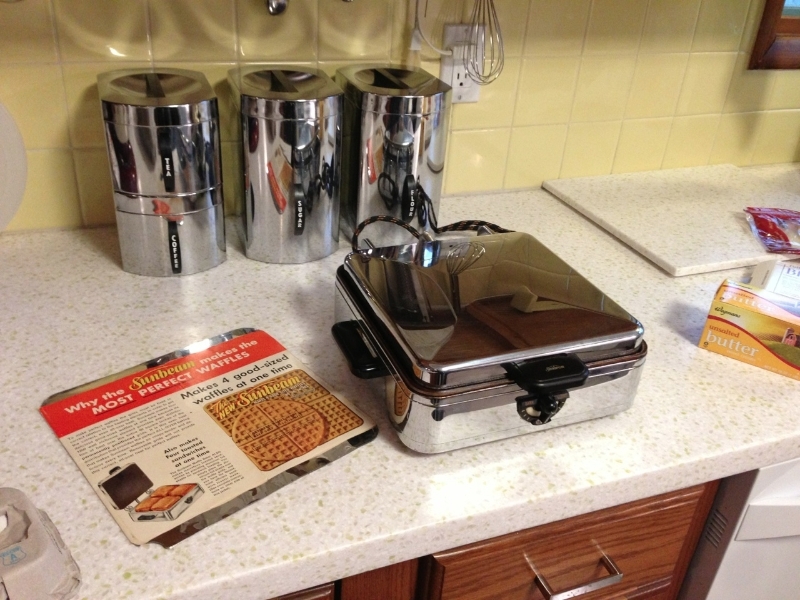 love the shine of the chrome on the waffle maker and the canisters!